It is a pinnacle for any cricket playing country to attain test playing status from ICC. Already ten countries have test status and now recently two more countries attain this status. Ireland and Afghanistan are the latest entrants to test arena deserve and they deserve accolades for showing consistency in their performance and attaining the status of 11th and 12th test playing nation respectively. Afghanistan is slotted to play its maiden test match against India in June. On the other hand, Ireland will enter the test arena by playing Pakistan a test match at home from 11th May to 15th May. Once it was a tradition that a team entering test arena will play its maiden test match against England. This tradition was so deeply rooted in the annals of cricket that England send two teams at the same time to New Zealand and West Indies as both these countries were granted test status at the same time and to maintain status quo, two English teams were send to different countries at the same time. The tradition that England will play a debutant country was broken in 1952 when Pakistan played its maiden test match against India at Delhi. India has the privilege of playing against three test debutants. Other than Pakistan, they have also played against Zimbabwe and Bangladesh in their maiden test matches. Pakistan will be playing against a debutant country for the first time. A common thought is that an experienced Pakistan team which is playing test cricket for more than 65 years will stream roll the inexperienced Irish team but in my view this is not an easy task. Ireland’s team has a huge advantage that their players know the conditions better than Pakistan. Though they are inexperienced at test level but have players in their squad who have played more than 100 first class matches and this experience at first class level will help the Irish players a great deal in the upcoming test match. Knowledge of conditions and experience of first class matches can prove helpful. It is because of these factors that Zimbabwe was able to hold the mighty Indian team to a draw in its maiden test match at Harare. 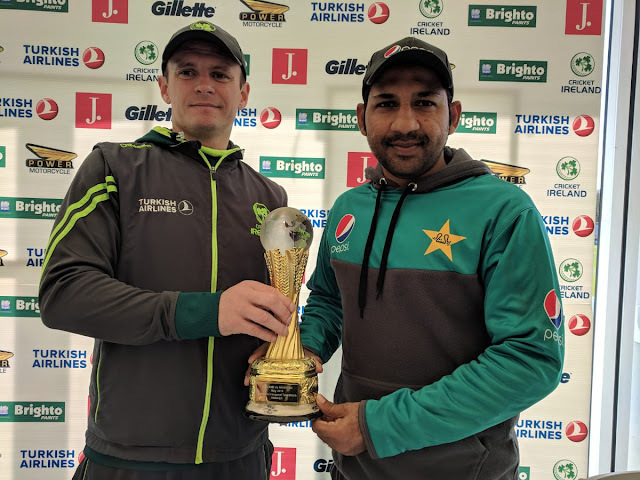 Pakistan’s test team is considerably weakened after the retirement of its stalwarts Misbah Ul Haq and Younus Khan as a result of which a weakened Sri Lankan team was able to whitewash Pakistan in the test matches played in UAE few months ago. Pakistan in recent months has shown good performance in shorter version of the game but unfortunately nation’s combination in test matches is unstable. Pakistan team is in a test and trial stage and is unaware of their best combination. In my view Pakistan should go in with six proper batsman, a wicketkeeper and four bowlers. Pakistan in two practice matches have tried Faheem Ashraf to fill in an all-rounder slot but this experiment failed so far. On the contrary the good omen for Pakistan is that Shadab Khan has bowled well in the two practice matches. While embarking on the tour, team management was firm that in early summers in UK, a leg spinner will not be successful and team may go in with four seam bowlers in test matches. Shadab khan with his performance in side matches proved them wrong and now his inclusion in the test squad is almost certain. Presence of Shadab khan will give the surprise element to Pakistan’s bowling line up and also allow captain to rotate his fast bowlers. Ireland’s players are good players of fast bowling but are alien against leg spin. Shadab in the absence of Yasir Shah can also prove handful in the test matches against England later this month. Pakistan think tank should play Asad Shafiq at No.5 or 6 in the batting line up. Although Asad is an experienced player but his performance in the lower middle order is better and team management should keep him on the batting slot which he liked the most. Australia is the only team to win its maiden test whereas Pakistan, West Indies and England tasted their first ever test victory in the second test match of their history. Ireland has the experience and capability to surprise Pakistan team which is historically susceptible to moving ball and can become second team after Australia to win their maiden test match. Early news suggests that this match will be played on a green pitch and Pakistan have to remain alert and play carefully and sensibly to prevent Ireland from winning its maiden test match.